Asher's debut album, still a timeless best-seller after more than twenty years! A largely instrumental original collection of the classical, the pastoral, the visionary and the epic. There are haunting piano narratives, baroque-style cantatas featuring oboe and harpsichord, sensual and soaring modern pieces, and five bonus tracks in addition to the original, which introduce some gentle vocal folk melodies. One can detect hints of the Celtic, Jewish, French and Spanish folk traditions. Endlessly surprising and alluring! Several of Asher Quinn's albums have been re-released in the later part of the 2000's, and for very good reason; they are New Age masterpieces. Open Secret, Quinn's debut album, is no exception to this praise. What makes Quinn's songwriting so brilliant is that he firmly establishes the type of sound indicative of New Wave music, without falling into some of its trappings. As relaxing and soothing as many of his arrangements are, Quinn still finds room for some stirring guitar solos, layered instrumentation, and elements of progression, not often heard in New Age music. Part of the reason for this may be from the progressive rock artists that lend their considerable skills to the recording. The guitar playing throughout the disc is performed by original Genesis guitarist Anthony Phillips and Camel guitarist Andy Latimer. Quinn starts his debut with 'Sacred Heart'. The mood established is light and soothing, while almost sounding classical in a way. The keyboards, played by Quinn and Phillips, sound like harpsichords. As the general refrain continues, more instruments are added, including the flute, played by Cynthia Roberts and the violin played by Ivor McGregor. The layering of instruments happens effortlessly and produces gorgeous results. The following track, 'Journey To A Remarkable Place', is a percussion heavy piece, led by Tristan Maillot. Maillot's drumming has an exotic tone to it, and continually drives the piece forward. Unfortunately, the main melody is a bit lacking despite the lush arrangement. As the song continues, the stirring keyboards sound like they're going to crescendo, but never quite do so, just as the song as a whole constantly feels as if it's building up to a moment that it doesn't reach. This could be a fitting allusion to the title of the song though. The percussion really gives off the sensation of an exotic journey and as the old adage goes, the adventure is in the journey, not the destination. 'Soldier Of Love' is a more engaging track due largely to the fuzz guitar solo that occurs during the second half of the song. Quinn's brand of New Age does not shy away from breaking from the established melody to feature great performances such as the one featured here. While the rest of the song is calm and melodic, the lead solo has some muscle behind it, arresting the attention of the listener but still fitting in with the tone of the song. Quinn throws in a couple of shorter, melodic pieces, 'Days Of Honey' and 'Violette'. The change of pacing is welcome as it arrives around the album's midpoint, making for a well placed transition to the longer songs on the album's second half. 'Violette' is particularly striking; the texture of the song is elegant all around, from the subdued bass playing to the piano melody and overlayed keyboards. 'Days Of Honey' has a similar kind of minstrel feeling that 'Sacred Heart' has, but in a more condensed form. Originally, Open Secret closed with its title track, an epic seven minute piece, marked by exceptional guitar playing, both Spanish and lead. On this re-release, the song 'Little Wolf' has been added before it. 'Little Wolf' is a sprawling piano piece, nearly nine and a half minutes in length. The changes that occur throughout the song are pleasant and riveting; it's hard to imagine this song not being present on the album. However, its presence looms large over the title track and detracts a little from the transition that would've followed from 'Luna Nueva' instead. This is just a mild quibble though over having two fantastic songs back to back as opposed to spread out over the album. Quinn ends his reissue of Open Secret with four bonus vocal tracks. Considering the rest of the album is instrumental, it was a wise decision to place the remaining songs at the end. Quinn's vocals are pleasing here, though understated, sounding somewhere between Neil Tennant from Pet Shop Boys and Al Stewart. That said, each of the bonus tracks have a similar instrumental feel to them and only add to the album's value. 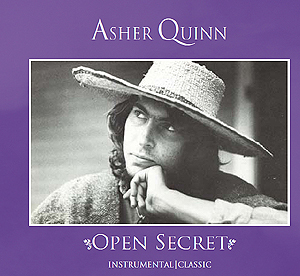 Open Secret is a fantastic debut from Asher Quinn, and its re-release is an absolute treasure. While firmly planted in the New Age genre, there are some elements of progressive rock that give Quinn's work some cross-genre appeal. The very mild flaws in Open Secret do almost nothing to diminish its status as a fantastic recording, and a must have for any fan of New Age works. Some day, very many years ago, I received a compilation cassette with the track 'Soldier of love' on it. I was stung by the beauty of this music. This music has always been in my heart. I would be very obliged if there is a chance for you to supply me. I wanted to tell you that I had this recording of the track 'Open secret' that I taped from a radio station when I lived in Memphis, TN, back in 1991. I really loved this song and keep it all these years, but I never found out who sang it or what the title was. For years I kept typing in the lyrics on the web, but to no avail. Finally, last night, I tried again, and BAM! I found it! Many thanks for sending out the latest version of Open Secret. I recall vividly putting that original cassette on in the car, (which I had got from a little shop in Merton (Abbey Mills) and it was about Christmas-time, snow on the ground, and I was so moved by it. And then came the title track, last of all, and I seriously cannot ever recall a piece of music, or any art for that matter, which touched me like that song. I can remember coming into the driveway of my wife's (Charlotte's) parents house, and running in to say I could not believe what I had just heard. One of the most inspirational CD's ever made. My wife and I were married in Palm Springs, and on our honeymoon sought music in a small mountain village. A small shoppe suggested the hottest sound on their shelves... Open Secret. This astonishing music helped change our once turbulent. Open Secret brings me so much comfort in these difficult days, especially the song 'Shine brightly'. I think your tune 'Soldier of love' is the finest music I have ever heard in my whole life. Dear Asha, your music is mistical and it takes me into another world almost. The things you talk about in your songs I understand and feel the same feelings. The title track on Open Secret is the one I feel for the most. Dear Asher, I recently bought Open Secret and was so impressed I bought Mystic Heart, Amadora, Wings of Fire and Single as Love as well. I can say with honesty I like every track. Every track is so different and reaches me in different ways. 'Luna nueva' is the most enduring track for me. The music from Open Secret always makes me happy. We have your recording Open Secret which we find really outstandingly beautiful, and play it very often. Recently I was talking to a poet in California called Rod McKuen who is reputed to have one of the largest record collections in the world. An album he wanted to play me was - yes, you've guessed - Open Secret.